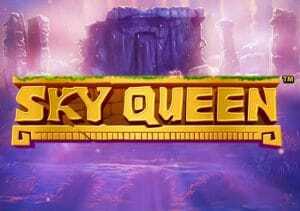 Venture deep into the rainforest and go hunting for treasure from a lost civilisation in Sky Queen. Created by Playtech, this colourful 5 reel, 50 payline video slot comes with some cracking extras. Look out for expanding wilds, streak re-spins that can award 1 of 4 jackpot prizes and a free spins round. Play on all devices from between 25p and £500 per spin. The design here isn’t the most sophisticated you’ll see but it works well with this theme. The reels are set against a jungle settlement shrouded in mist. In addition to the lower value royal values are a bowl, an animal head totem and a green burial mask. Top of the standard payers is the big cat which awards 3 times your bet if you land 5 on a payline. Appearing on reels 2, 3, 4 and 5 only in the base game is the Sky Queen who is the wild. This replaces everything apart from the sun and scatter symbols. The wild expands to fill the whole of the reel whenever it hits. There are 2 potentially exciting bonuses in Sky Queen. Fire Blaze Respin feature – joining the standard symbols, wild and scatter is the sun. When 6 or more of these land on the same spin, they’ll lock in position and you’ll receive 3 streak respins. The triggering suns are held and reels spin again. If a new sun lands, the respins reset to 3. The respins continue until you’re out of respins or the whole of the screen is filled with suns. You’ll notice that each sun comes with a cash value of up to 50 times your bet attached or includes a star. At the end of the respins, all the cash amounts are added together and that’s your prize. Fill the screen with jackpot stars and you’ll pocket the Grand Jackpot of 2,000 times your bet. The sun stars can also trigger lower jackpots of 20, 100 or 500 times your bet. Free Games feature – land 3, 4 or 5 of the pyramid scatter and you’ll receive an award of 1, 10 or 50 times your bet as well as triggering the second feature. Your reward here is 8 free spins. During these free spins, the wild can hit on reel 1 in addition to the other 4 reels. If the suns fall nicely you can trigger the Fire Blaze Respin feature. Landing 3 or more pyramids results in a free spins re-trigger too and another round of 8 free spins. The design here might be a little primitive (which is fine given the theme) but the gameplay impresses. The jackpot element makes the respins a very tempting proposition. Throw the free spins into the mix and this is one jungle trek we’re happy to make. If you like the theme, I would opt for NetEnt’s Gonzo’s Quest.